Although logic and math were her favorite subjects when she was home schooled, computer science never struck her as a career option, even though her dad was a software engineer. So when she started college at Whitworth University in Spokane, Wash., she chose athletic training for her major. “Absolutely none of my female friends were interested in engineering, so I never even considered it before my father suggested that I take a computer science class,” Nicole says. By that time she had transferred to Oregon State and was looking for a major that would be more of a challenge. “After programming for the first time ever in my sophomore year, all of the logic and critical thinking problems I enjoyed so much when I was younger came back to me,” she says. 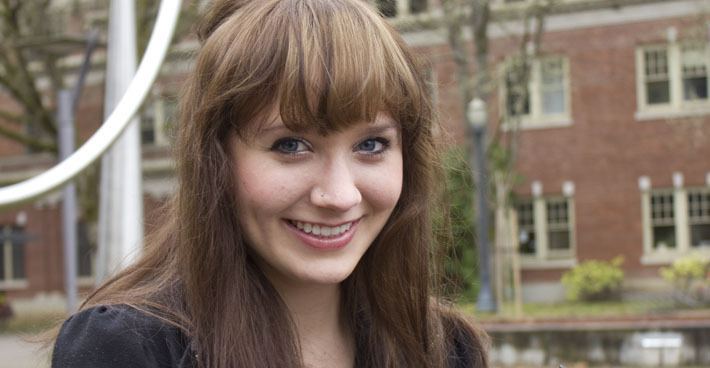 But Nicole’s passion crystallized when she wrote her first app, OSU Connect, at her job with Oregon State University Central Web Services. Having never programmed in the required languages, she learned many technical skills through the experience and gained practical knowledge about how to manage a project and interact with clients. The opportunities and mentorship Nicole received in Central Web Services helped her focus her interest on mobile app development and she sought out more opportunities to write apps. Last year at an Oregon State App-Hackathon she won the prize for Most Commercial Potential for her app called JustRipe. 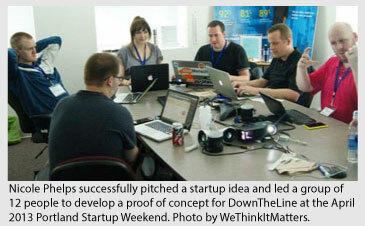 She also participated in a Portland Startup Weekend competition where her app idea, DownTheLine, was selected and she led a team of 12 to develop it. This year she is one of the leaders of the OSU App Club. To top it off she did a 6-month internship at Maps Credit Union where she wrote an app called BuyLocal that she expects will be used nationally by other credit unions. “My experience at OSU has been invaluable to me. I was able to discover who I am as a person, as a student, and as someone in the workforce,” Nicole says. Her experiences have already translated into a job. She accepted a lead mobile developer position with Bioniq Health, a California based startup company, and will work remotely until she graduates in June. But her goals don’t end there. “I hope that one day I will be a prominent figure in the software world and help influence middle school and high school students, especially females, to get some early hands-on experience with programming and design,” she says.